Young Guns frequently collaborates with top aerial and circus companies. We have a close professional relationship with Cirque Bijou, an innovative company who produce unique, large-scale performances, often in conjunction with rock concerts. Working together with Cirque Bijou we have created bespoke choreographed shows and cabaret performances. We have also supplied acts for hundreds of high end opulent parties calling for world-class, stylish entertainment. 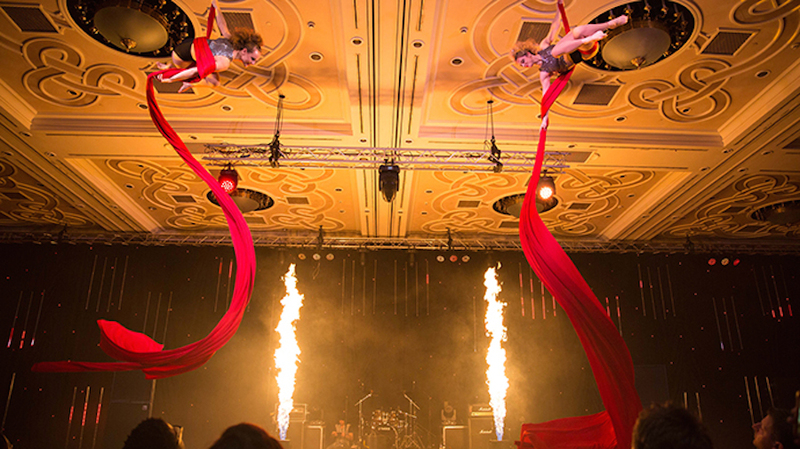 The aerial act shows are perfect for large gala events, mesmerising audiences with a seamless combination of stunning performances, unique special effects and dramatic choreography. Acrobatic performances include aerial hoops, silks, trapezes and kites, with each performer combining grace, strength, and flexibility with either a simple white outfit or with led lighting in the costume. The Aerial Straps Duets is one of the most exciting aerial acts in the world. An act of power and beauty, this aerial straps act soars above the heads of the audience with moves of extreme strength and flexibility. As well as supplying spinning aerial acrobatics that perform at dizzying heights, we can also provide hand balancing and contortion acts.